This is book 4 in the Harry Potter series and was published in July 2000. Published by Bloomsbury, the First Edition print run was over one million copies. To manage the huge increase in volume the printing was split between two print houses, Clays Ltd (who produced seven hundred and fifty thousand copies) and Omnia Press in Scotland (who printed the remaining quarter). This automatically makes the Omnia printing a harder book to find. The text in each book is identical other than that of the print house details on the copyright page. This is the first of the UK Harry Potter books to carry the words “First Edition”. This replaced the familiar 10 down to 1 print line on the copyright page seen in previous titles. A First Edition therefore clearly states “FIRST EDITION” on the copyright page. A later printing would be indicated by a run of numbers, the lowest indicating that particular print. Issued with a dustwrapper illustrated by Giles Greenfield and a retail price of £14.99, this book has illustrated boards which matches that of the dustwrapper. This book has "storyline errors" on pages 503 and 579 that were supposedly corrected during the first print run. However, these "points of issue" were still appearing in the seventh printing, so it is doubtful that these are actually errors or misprints. 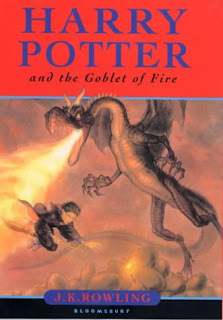 Goblet Of Fire is the first UK Harry Potter book to have a mass produced First Edition, it is therefore more common to find and less valuable than previous First Editions in the series. It is however a good starting point for those on a limited budget and beginning their collection.